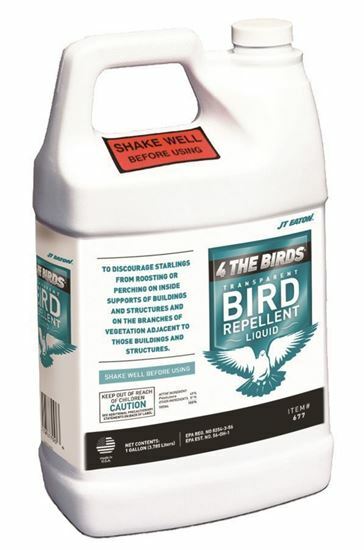 The JT Eaton 677 4 The birds bird repellent liquid is an ecological and humane way to rid buildings of pest birds without harming them. This bird repellent uses the active ingredient polybutene and can be applied to almost any structure where pest birds rest, roost or nest. The ingredient is uncomfortable for birds and prevents them from nesting wherever it is applied. This repellent comes in a 4-pack of 1-gallon containers. The JT Eaton 677 4 the birds bird repellent liquid comes with a 1-year limited warranty to protect against defects in material and workmanship. JT Eaton's mission is to manufacture and distribute products designed to eradicate pests. We continually seek out new ways to provide consumers with the knowledge and products they need to create a healthier and safer world. JT Eaton has been family owned and operated since 1932 and they manufacture and sell only the highest quality products.